A classic comfort food that is loved by the entire family. 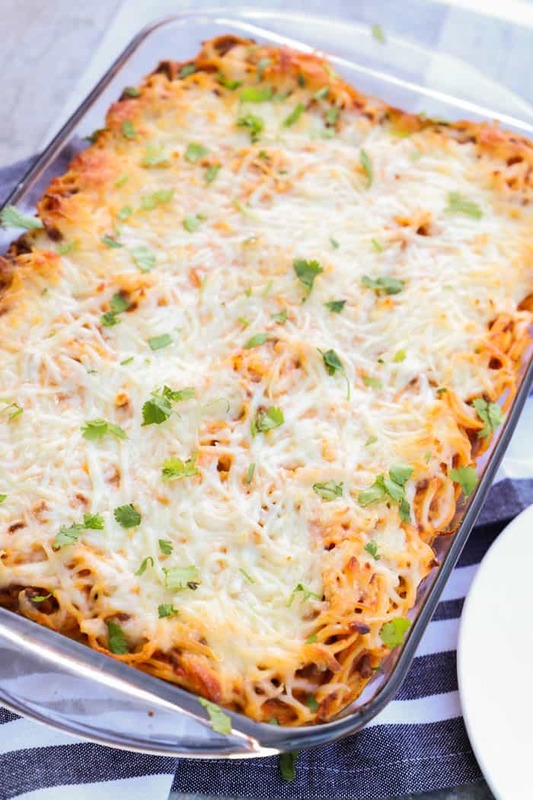 This Baked Spaghetti Casserole is simple to make and taste amazing. We tossed the classed spaghetti dinner into a casserole dish and had this awesome Baked Spaghetti for family dinner last night! It makes such a large amount, and it’s perfect for guests. The best thing is, it tastes great as leftovers. 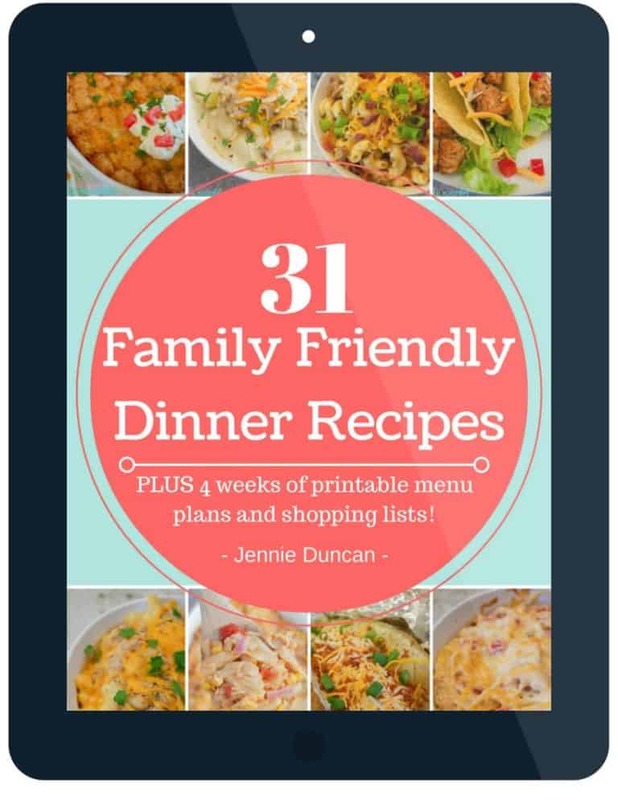 Last night we had family over, and I wanted a quick easy dinner that would go a long way! Spaghetti is a classic budget-friendly meal to feed a large crowd. I went with baked spaghetti, and my guests just let the compliments and yummy noises roll in! 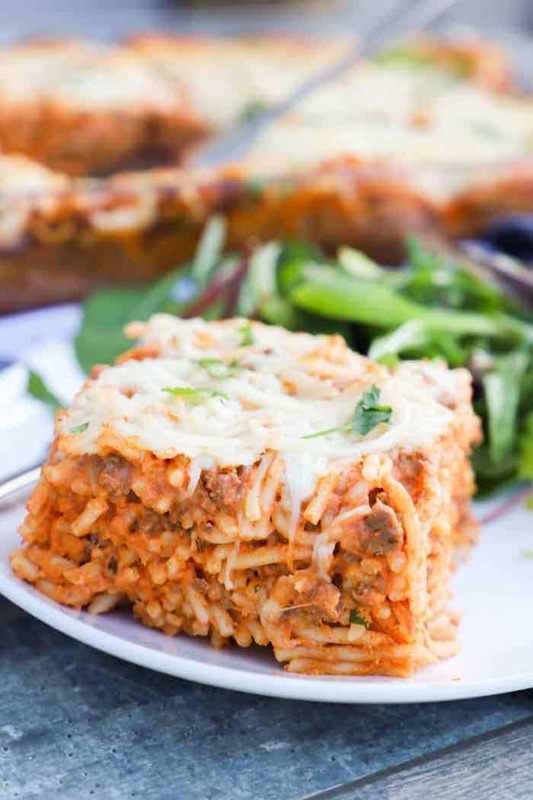 The baked spaghetti is easy to make, and only a few extra ingredients than your classic spaghetti dinner. Step one: Start by preheating your oven and prepare a casserole dish with non-stick cooking spray. For this recipe, I used a 9×13 casserole dish. Step two: Start by preparing your spaghetti according to the package instructions. Once cooked drain and return to pot. Step three: Whisk together egg, grated parmesan cheese, and whipped cream cheese. Add this to your cooked pasta and toss to coat. If you want to use a regular block of cream cheese then you would want to soften it to room temperature. Step four: In a skillet cook and crumble ground beef. Once cooked drain fat then add in spaghetti sauce to your beef. Add this to your cooked and coated spaghetti and mix together well. Add this to your prepared casserole dish. Step five: Last go ahead and top with mozzarella cheese and then bake for 40-45 minutes. Allow to rest for 10 minutes then slice and serve. I garnished mine with freshly diced parsley. We love serving this dish with garlic bread and a big salad. Here are a few more of our favorite recipes to serve with this dinner. 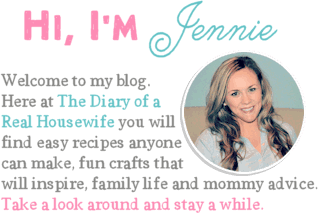 Taco Spaghetti: This recipe is a family favorite. I love anything taco and the flavor on this one is amazing. Parmesan Garlic Spaghetti: This recipe makes the perfect dinner or side dish recipe. With only 5 simple ingredients it’s so easy to make. Easy Chicken Spaghetti: I love this recipe! I usually make spaghetti with ground beef but this white creamy spaghetti with chicken is one of my all time favorites. Preheat your oven to 350 degrees and prepare a 9x13 casserole dish with non-stick cooking spray. Cook spaghetti according to the package instructions. Once cooked drain and return to pot. Whisk together egg, grated parmesan cheese, and whipped cream cheese. Add this to your cooked pasta and toss to coat. In a skillet cook and crumble ground beef. Once cooked drain fat then add spaghetti sauce to your beef. Add this to your cooked and coated spaghetti and mix together well. Add this to your prepared casserole dish. 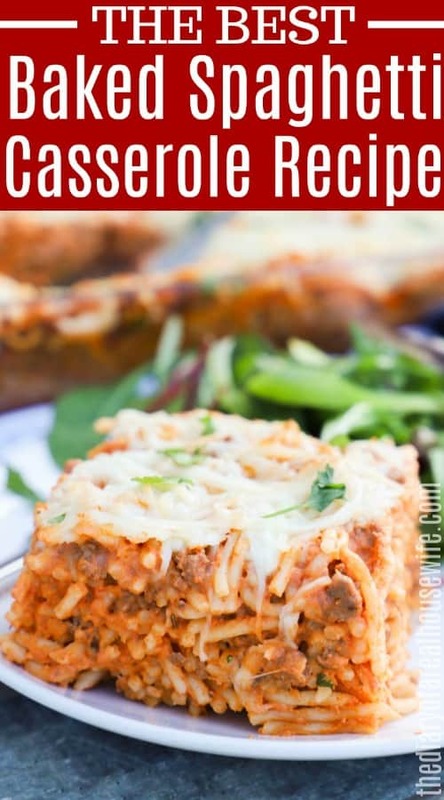 Top with mozzarella cheese and then bake for 40-45 minutes. Allow to rest for 10 minutes then slice and serve. Optional: garnish with diced fresh parsley. What an awesome idea – this would make such a quick and easy dinner. Thanks for sharing!